VIDEO: Wound Healing Might Be Improved With Staples Modeled On Porcupine Quills : Shots - Health News Surgeons would love to find a replacement for surgical staples — one that doesn't aggravate wounds on the way in and out. 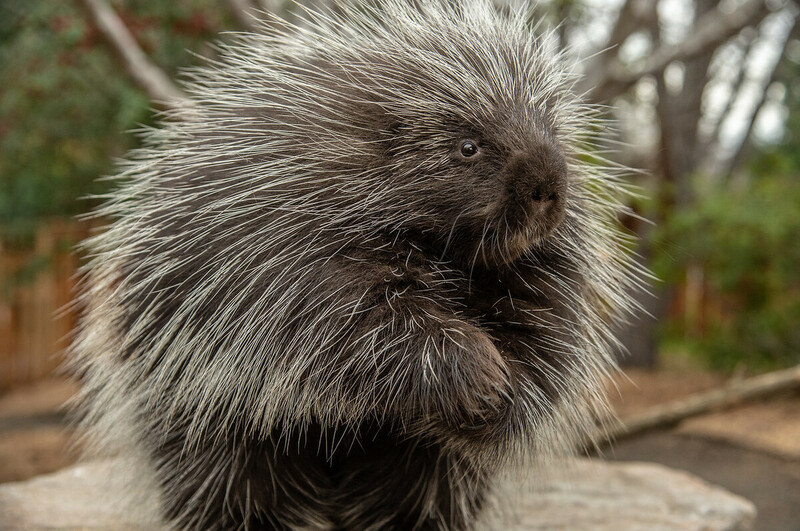 Bioengineers think they've found the right model — a porcupine's quill. At first, the idea of using porcupine quills to patch up wounds sounds torturous. But, taking inspiration from the spiky rodent, researchers have begun to work on a new type of surgical staple that may be less damaging — and less painful — than current staples. Worldwide, surgeons perform more than 4 million operations annually, usually using sutures and staples to close wounds. Yet these traditional tools designed to aid healing can create their own problems. "We've been using sutures and staples for decades, and they've been incredibly useful," says Jeff Karp, a bioengineer at Brigham and Women's Hospital in Boston and professor of medicine at Harvard Medical School. "But there are challenges in terms of placing them for minimally invasive procedures." Surgical staples are faster to insert than sutures, which require a needle and thread, he explains. But current staples, made of metal, tear tissue on the way in and cause more damage when bent to stay in place. Karp and his team have been searching for new ways to hold tissue together. One brainstorming session led to a discussion of a porcupine and its quill. The North American porcupine appears cute, but it has more than 30,000 menacing quills covering much of its body, each one hollow and 2 to 3 inches long. The slow-moving herbivore uses the quills as a last-resort defense against predators. The quills are actually specialized hairs that mostly lie flat against the animal's body. Only when threatened will the porcupine erect them. And, contrary to a common myth, porcupines don't shoot the quills out from their bodies. "The wonderful thing about porcupines is that they seem to feel secure," said Uldis Roze, emeritus biology professor at Queens College, City University of New York. "They feel like they're not in danger, and they're sweet." When the porcupine is relaxed, its other hairs and fur hide most of the quills. When threatened, the adult porcupine displays three types of warnings before lashing out, according to Roze's book The North American Porcupine. First, the contrasting black and white pattern of the animal's quills and other hairs — known as aposematic coloration — is a visual warning signal. A unique pungent odor and ominous teeth are further clues that dogs, mountain lions and other potential predators should stay away. The North American porcupine has a cute face, but it has upward of 30,000 menacing quills covering much of its body. The slow-moving herbivore uses them as a last-resort defense against predators. If that doesn't work, a porcupine will use its powerful, spiky tail to slap at the aggressor. Each quill is held in place by its own special structure in the porcupine's skin. Direct physical contact with a predator causes the porcupine's skin to release the quill. Quills from North American porcupines pack a hidden punch: microscopic, backward-facing barbs. Covering just the needlelike tip of the quills, the barbs make removing a quill difficult, because they flare out when pulled in a direction opposite to the way they went in. "The mountain lion just accepts it," said Roze. "It's part of the work of killing a porcupine." Of course, that mountain lion's days of porcupine feasting may end forever if the quills keep it from eating or end up in the cat's vulnerable internal organs. 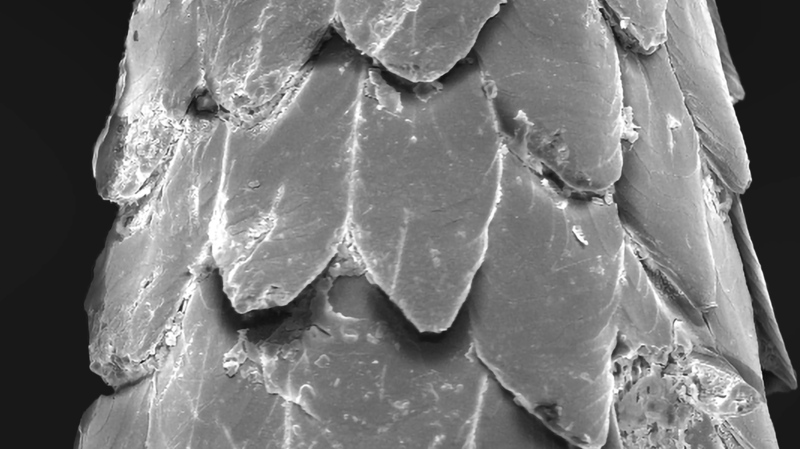 This image from a scanning electron microscope homes in on the tiny barbs on the tip of a porcupine quill. Still, a quill passing through the body is far from painless — it's excruciating — as Roze knows from personal experience. He was once quilled in his bicep while up in a tree, trying to catch a porcupine. Despite his wife's suggestion afterward that he immediately seek medical care, he waited two harrowing days. By that time, the quill had traveled in one direction and cleanly exited his lower arm. He kept the quill as a souvenir. The quill's barbs eased its penetration into his flesh. They also helped drive the quill in deeper, until it exited (though it would have been stopped by a harder material, such as bone). It was the barbs that most interested Karp. He and his team ran experiments comparing a barbed quill to a barbless quill, measuring the forces required to insert and remove barbed spears. In contrast to a barbless quill or a surgical staple — which tear the tissue and create gaps that are susceptible to infection — the barbed quill's design means it does minimal damage on the way in, the researchers found. A new type of medical staple that had two barbed tips would require much less effort to place, Karp figures, and the gripping power of the barbs would hold it in position without needing to bend the staple. Karp says he anticipates making the new staples out of biodegradable material so they will fully dissolve over time without having to be removed. The challenge now is to re-create the full barb's shape. "Nature has designs that humans can't achieve yet, at least at large scale," Karp says. "Large-scale manufacturing is a human problem." But if the right technologies become available, he estimates that human testing of porcupine quill-inspired tools could begin in two to five years. "This could be an enabler for smaller incisions to be made in a large number of surgeries," Karp says. That would be good news for both surgeons and patients. This post and video were produced by our friends at Deep Look, a wildlife video series from KQED and PBS Digital Studios that explores "the unseen at the very edge of our visible world." KQED's Josh Cassidy is the lead producer and cinematographer for Deep Look. Laura Shields works as an intern for the series.